There are many who insist that the number one issue in the U.S. is race, and though this doesn't hold up under scrutiny (we would argue that banking and class warfare use racism to maintain control), race is certainly a major issue. One of the most telling aspects of racial politics, no matter where in the world it surfaces, is the strict boundary lines that it follows. The oldest cities in the world still have quarters that are identified by ethnicity or religion, and in newer, generally western cities, real estate and voting apportionment practices are used to demarcate and manipulate power, reducing and enhancing the power of various racial groups and political factions. One of the prime cities for exploring the subtleties of such machinations is Chicago, because of the Northern states pretentiousness regarding race relations and the fact that Chicago serves as the setting for Lorraine Hansberry's A Raisin in the Sun. In the annals of African-American literature, A Raisin in the Sun holds a special place because of its success at communicating to white audiences as a play (four Tony nominations in 1960), a musical (a Tony for Best Musical, 1973), a film (starring Sidney Poitier and Ruby Dee, 1961, Golden Globe nominations and special award at Cannes), a made for TV movie (starring Danny Glover and Esther Rolle, 1989, based on the Roundabout Theatre Company revival, three Emmy nominations), the 2004 Broadway revival, and the 2008 made for TV movie. 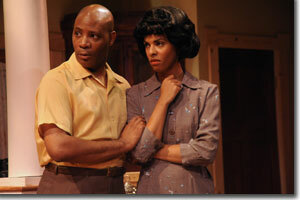 Bruce Norris' Clybourne Park, which won the 2011 Pulitzer Prize for Drama, takes its name from the fictional section of Chicago, based on the actual Woodlawn neighborhood, in which Hansberry's play takes place. The symmetry of the Norris' story—In Act I, a white couple sells their home to the first black couple in the neighborhood over the objections of the residents and the vicar; in Act II, a generation or so later, the now all-black neighborhood is being gentrified, and the first white couple to buy in is being asked to retain the historical integrity of the landmark house by blacks—is both telling and somewhat contrived, particularly because the adversaries in second act are directly related to the adversaries in the first act; however, this juxtaposition does amplify the playwright's message, while giving the play a post-modern feel, by way of the radical shift in characters. Unlike contemporary novels, though, that have the time to develop seemingly unrelated plots, in a two-hour play, time is of the essence and, in Clybourne Park, precious moments, potentially loaded with irony, are lost as we slowly come to grips with the separate reality in Act II (Is it actors self-consciously analyzing the script? No, it's a neighbor association mediation.). By the time the connections between the two acts become apparent, we we are further distracted by the intrusion of the B plot (war, post traumatic stress, and familial dysfunction—mostly in Act I) into the A plot (racism, particularly as it is expressed in neighborhood identities and unspoken real estate practices—in both Acts), leaving us without a bona fide resolution to the principal through line, that is, no catharsis regarding the race issues. Despite these structural issues, the performances are compelling, making the most of the playwright's knack for finding the uncomfortable seams in black-white relations and exploiting these for maximum emotional effect. As the white couple that is moving out of the neighborhood to try to forget their son's tragedy and their neighbor's lack of compassion, Erik Sandvold (Russ) and Dee Covington (Bev) draw us into their struggle, Sandvold with exasperation for the hypocrisy to which Russ is subject and Covington with quirky timing and irrepressible cheeriness in the face of compounded loss. They are further challenged by a vicar wearing a truss (Andy Waldschmidt), the bigoted head of the local homeowners association (Josh Hartwell) and his very pregnant and deaf wife (C. Kelly Leo), all of whom hit a series of prejudicial notes in their interactions with the circumspect African-American help (ZZ Moor) and her thoughtful husband (Chris Davenport). 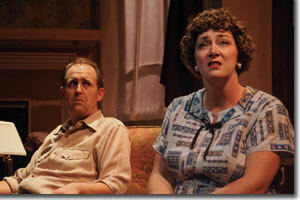 Hartwell does a bang up job in the difficult racist roles and Leo shines as a pair of slightly askew women. Wonderfully nuanced performances from Davenport, Moor, and Waldschmidt as well. Susan Crabtree's impressive set—both in stature and detail—is a world unto itself. Curious Theatre Company's regional premiere of Clybourne Park runs through October 15th. 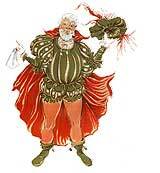 303-623-0524 or www.curioustheatre.org.